I get asked a lot of questions when I recommend general anesthesia for a patient, and rightfully so. Believe me, I understand your concerns, and I do everything in my power to get your questions answered. Our wonderful anesthesiologist, Dr. Jon Bennett will also speak with you at any time before and after the procedure. We want you and your child to have the best, and safest experience in our office, and sometimes general anesthesia is the best way of achieving this. So I invite any and all questions regarding general anesthesia and so does Dr. Bennett, please do not put it off any longer, let us answer your questions and address your concerns. Our emails are below and if you would like his direct phone number, give us a call and we will be happy to share that with you. And if you have a chance, check out both of our websites for more information. We love to give recognition to our new friends. Here are the new patients that became members of our practice family this August. We’d like to welcome you & wish you all the best. Antonio Almanzi, Carmel Artstein, Brandon Ball, Sophee J. Bernard, Emily Bodine, Makenna Bolin, Dominick Bonilla, Annika K. & Nicholas S. Bretherton, Kyle Brown, Anthony Cadiente, Livana Carlos, David Casillas, Nicholas Castillo, Ethan Chek, Austin & Melanie Colvin, Gavin & Matthew R. Cuellar, Melody Dadgar, Jayden Diaz, Bruno & Johnny & Ruby Flaim, Michael Friedman, Patrica Garay, Jack & Kate Gibson, Dylan Gold, Alexander & David Gonzalez, Jonah Gonzalez, Elissa Groves, Nathaniel & Nicholas Gurrola, Adam Harlow, Jacob Hayes, Taylor Hermes, Dylan Hervey, Logan Jette, Kai Johnson, Kalyn Johnson, Stephen R. Juckett, Evan Kao, Alice Kermode, Maullica Khiev, Bella Kim, Izaac D. & Rylee M. Kitchens, Mackenzie Koet, Kainalu Langan, Lauren Ma, Isabella Macias, Cole Mann, Lucia Medina, Brynn Minter, Payton Miraglia, Guillermo & Silverio Moreno, Michaela Ngo, Brittny & Ian & Kirstyn Nold, Nicholas & Samantha Ochoa, Angelo Plakakis, Cameron Rauch, Skye Reynolds-Nickelsen, Daisy Rivera, Vincent Roberts, Juan Alexander & Serena Rodriguez, Alina & Mia Romo, Maxson Sauser, Quinn Shell, Isaiah J. Small, Tessa & William Splanger, Luke Steimke, Thomas N. Stolze, Allison Tavarez, Joleen Thav, Michaelan Thorne, Katharine E. & Jose L. Vega III, Pierce Velker, and Elijah Joseph Devin Williams. Now is the time to think about “Open Enrollment” for Dental Insurance and it is also the time to prepare your Flex Spending Accounts for the coming year. Most businesses have this month of September as the time to make changes to your dental plan that will become effective in January 2011. Often, we find that people seem to think they know what they have signed up for, only to find out they wished they had chosen the other insurance for their orthodontic needs. Sometimes this mistake can delay dental and orthodontic treatment for a full year. We would like to help you in making the best choice. Please call the office now for your FREE orthodontic consultation appointment. At this appointment Dr. Sanjideh (our incredible new orthodontist) will do a complete exam and let you know if treatment is recommended. Also, Veronica or Kerin (our incredible treatment coordinators) will go over your expenses to help you prepare your finances and insurance choices. In addition, having an orthodontic consultation appointment before January 2011 can help prepare you for your medical and dental taxed free savings known as Flex Spending Accounts or Cafeteria Plans. Fierce weather, flu epidemics, gasoline shortages, power outages, and other natural or man-made disasters: you never know when an emergency situation may strike. Since September is America’s National Preparedness Month, why not take steps now to gather supplies and make plans? Depending on the type of emergency, make sure that all family members know what to do, where supplies are stored, and how to get in contact with each other. These are simple yet effective ways to give you and your family peace of mind. Many children are calm, comfortable, and confident in a pediatric dental office like ours. That’s mainly because pediatric dentists, like Dr. Stella and Dr. Golian, specialize in treating children, and we choose to work in a pediatric dental office because we like kids and are willing to take extra steps to maximize your child’s comfort during their dental visit. Sometimes however, your child may still feel anxious during treatment and may need more support than a gentle, caring manner to feel comfortable. Laughing Gas (Nitrous Oxide) is a safe, effective technique to calm a child’s fear or anxiety- that’s when Laughing Gas comes in. What is Laughing Gas (Nitrous Oxide)? Your child will smell a sweet, pleasent aroma and experience a sense of well-being and relaxation. If your child is worried by the sights, sounds, or sensations of dental treatment, he/she may respond more positively with the use of Nitrous Oxide. Very safe. 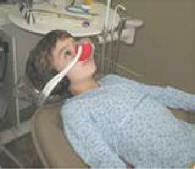 Nitrous Oxide is perhaps the safest sedative in dentistry. It has the following qualities: It is well tolerated, not addictive, has quick onset, is reversible, can be adjusted in various concentrations, and is non-allergic. 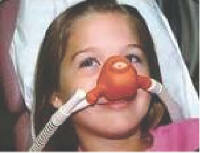 Your child remains fully conscious (keeps all natural reflexes) when breathing Nitrous Oxide. Inform Dr. Stella, or treating dentist, about any respiratory condition for your child, such as colds & allergies that can cause stuffy noses, as they may limit the effectiveness of Nitrous Oxide. Second, inform Dr. Stella, or treating dentist, if your child is taking any medication on the day of the appointment. Since all children are not alike, every service is tailored to your child as an individual. Nitrous Oxide may not be effective for some children, especially those who have severe anxiety, nasal congestion, or discomfort wearing a nasal mask. Dr. Stella & Dr. Golian will review your child’s medical history and inform you if Nitrous Oxide is recommended for your child. *Let your child know we have GRAPE, STRAWBERRY, ORANGE, VANILLA, MINT, & BUBBLEGUM scented noses for them. Also, talk to us about providing you with a sample take-home nasal mask so you may practice wearing it at home, that way your child may be better prepared for their Nitrous Oxide visit. We value your time, as much as we hope you value ours. If you have any questions regarding this office policy or would like a copy of our office policies please email us Info@FuntasticDental.com or call us (562) 627-8800. Thank you for your understanding regarding this matter.